Perfect match: This addition of a Queen Anne home on Marion in Oak Park follows the Secretary of the Interior�s Standards for Rehabilitation. It is set back from the historic main mass, is smaller in scale and is delicately attached via a flat roof link. The materials all match the original palate and the forms are stylistically consistent, unifying the new construction with the historic. To the right a small mud room addition is distinct yet compatible. Living in a community rich with architecture does not make the average homeowner an expert on the fine art of architecture. We are sensitized by cohabitating the same streets lined with interesting structures, yet when someone builds or adds to a home that is not compatible with the adjacent neighbors, we are immediately alarmed. Architecture, in context, displays a way of respecting the neighborhood in scale, materials and style. This is not to say the new building or addition should not contrast and create variety on the street. To address these issues, retaining professional consulting can be challenging. Architects can usually be placed in three basic categories: the modernist, the historicist and what I would call the inventor. The modernist camp is staunch about the style they work. They believe modernism is the only valid style, striving to make their buildings a reflection of the times. Conversely, the historicist is primarily interested in the history of the structure and the architectural style. 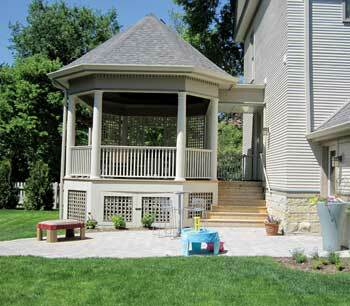 The style may be instructive, driving the design of an addition. Walking a thin line between the opposing modernist and historicist, the inventor practices the idea of invention within tradition. This professional is inclusive, a student of history, considering all relevant influences. They believe that creation within tradition is an appropriate and sensible basis for design. Frankly, it doesn’t matter about the style of architecture you prefer. What is important is that the project be respectful to the historical character of the house and it be a good neighbor. Respect is the operative word. The truth is, to realize a creative and sensitive project one needs to engage a good architect, a designer driven to find an appropriate form that satisfies the function while valuing the neighborhood. In Oak Park and River Forest, we find a mature suburban landscape that is completely built, with very few infill lots available. Therefore, the vast majority of projects deal with historic structures, renovations, restorations and additions. Should you be located in a historic district the rules and approvals are much more stringent with the Historic Preservation Commission’s goal to protect the unique visual quality all historic buildings. The Secretary of Interior’s Standards for Rehabilitation must be met in order to receive a Certificate of Appropriateness from the commission. These 10 standards are described in one or two sentences and are seemingly straight forward, direct and simple to apply. Standard No. 9 reads, "New additions, exterior alterations, or related new construction shall not destroy the historic materials that characterize the property." This standard, which is the most interpretive and important to our community, can be confusing. The addition should be smaller in scale and not compete with the historic building. Furthermore, No. 9 requires that, "The new work shall be differentiated from the old and shall be compatible with the massing, size, scale and architectural features to protect the historic integrity of the property and its environment." This is where the art of architecture comes in. So, if you want a modernist addition to your traditional home, it will not be an issue of distinctness. The challenge will be to design something that is compatible and harmonious, subservient to the historic home, an addition that preserves the historic integrity of the property. I recommend anyone without an experienced architect to call Doug Kaarre, the preservation commission liaison at 358-5417 for a referral. He is very experienced at all preservation issues and maintains a list of qualified architects and builders. Another source for services is Landmarks Illinois at www.landsmarks.org. Whether you consider yourself aligned with the modernist, historicist or the inventor, matching up to the best architect should be apparent when reviewing a portfolio of work and education. A sensitive and experienced architect will make life much simpler for the inexperienced owner and make a lot of neighbors on your block a bit less anxious. Oak Parker Garret Eakin is an award winning architect, a historic preservation commissioner and an adjunct professor at the School of the Art Institute.